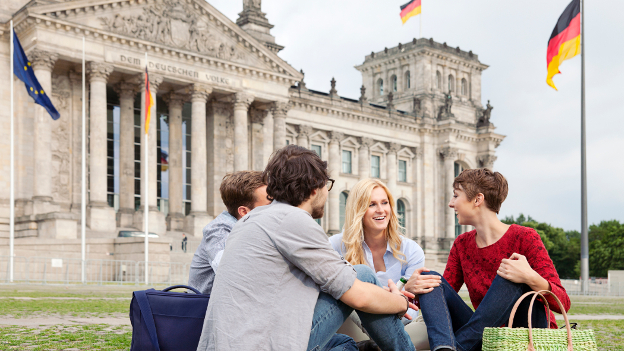 EMGIP (Émigré Memorial German Internship Program) offers internship opportunities for U.S. and Canadian students in the German parliament, the Bundestag. The internships are two months long and we try to match the position with the student’s interests and experiences. Interns will be placed within the Verwaltung, preferably with a Sekretariat working for their preferred Ausschuss. In addition to contributing to the respective offices, interns have the opportunity to study legislative and administrative procedures in the German parliament. Please see also EMGIP Landtag in the German State Parliaments administered by Cultural Vistas. DAAD programs are helping to create goodwill and professional relationships that will help build a solid basis for relations between Germany and North America. EMGIP Internships were founded in 1965 by Professors Louise Holborn and George Romoser with the assistance of many scholars of German affairs, especially in the social sciences and contemporary history, and with the financial and planning aid of various German offices also interested in encouraging the development of future generations of German experts. In view of the contributions of German émigrés, the experiential program was named Émigré Memorial German Internship Program. Applicants for EMGIP – Bundestag should possess outstanding academic records and personal integrity as well as sufficient knowledge of the German legislative process. Participants should be advanced undergraduates or graduate students in fields such as political science, international relations, law, history, economics or German. PhD students are not eligible. Students must be fluent in spoken German and possess excellent writing skills. U.S. and Canadian citizens and permanent residents are eligible to apply. International students who are enrolled in a full time course of study in the U.S. or Canada may also apply. German nationals are not eligible. Attention graduating seniors: Successful applicants must hand in a certificate of enrollment for the internship period to ensure student status in Germany or enroll at the Free University as program students (information about the enrollment process will be provided to successful candidates). The successful applicant will receive compensation of approximately EUR 1,800 per month from the German Bundestag. Subsidized health insurance is available through DAAD for a monthly fee. DAAD can help the interns to obtain housing in Berlin and make contacts with fellow international interns and German students. Travel expenses are the intern’s responsibility. The application deadline is September 15, 2017 for internships in 2018. Incomplete or late applications will not be accepted. Be sure to submit all materials and the correct amount of copies of each by the deadline. If your application meets the deadline, you will be notified by us if anything is missing from your file. Please do not call our office; you will receive an e-mail or letter of acknowledgment by the end of October. Please do not staple or bind any of the documents! The German Bundestag suggests that you choose a two-month period between September and mid-December when the Bundestag is in session. Placements during the spring are rare, but sometimes possible from May 1st. Since the spring session ends in late June, placements typically end in early July for the summer break. The Bundestag is not in session in July and August. In order to receive an optimal placement for your internship you should clearly state your particular interests in the essay. Short-listed candidates will be interviewed in German. Please type your application form, handwritten materials will not be accepted. Make sure to answer all questions on the form completely. Do not fill in any blanks with the phrase "see attached," even if you must refer to additional material. Do not forget to sign your application. Please submit your resume in chronological form. This Lebenslauf must be in German. Narrative or paragraph-form resumes are not acceptable. Your name should appear on each page. The essay should be no longer than 3 pages (1.5 space, pt.12) and should answer the question of why you are interested in the EMGIP-Bundestag Internship. You should mention the career goals you hope to achieve by completing an internship at the Bundestag. Please state what your expectations are regarding the character of the internship and what you as an intern have to offer. Give your first and second preferences as to the Ausschuss you would like to work for and any other relevant interests, but please do not indicate any preference for a political party. Be advised that the Verteidigungsausschuss does not offer any internship positions at all. Your name should appear on each page of the essay and you must hand in a German AND an English version. Submit three (3) original letters of recommendation printed on university letterhead from professors (not lecturers or TAs) at North American institutions in your major and relevant fields of study. The letters can be included in a sealed envelope with your application or should be sent separately to DAAD New York. It is your responsibility that the recommendations are received on time. Submit official transcripts of all post-secondary studies, including explanations of the grading systems. Please do not staple or bind any of your documents! Please see our Frequently Asked Questions Section. German language fluency is important for you to be able to carry out the assignments during your internship. Your writing skills in German must be equally excellent. How can I prepare for the internship? We recommend reading the Zeitschrift für Parlamentsfragen. Who do you consider an advanced undergraduate? Juniors and seniors have been the only successful undergraduate candidates in recent years. If you have additional questions regarding the EMGIP - Bundestag Internship, please contact: emgip[at]daad.org. If you are NOT a citizen or student in the UNITED STATES or CANADA, please see DAAD International.